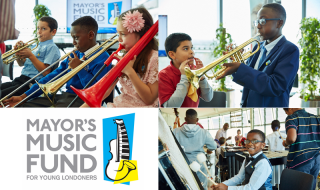 The London Music Fund is an independent charity with the Mayor of London as Patron. We provide grants of around £300,000 every year to enable thousands of children and young people across every London borough to develop their musical potential, through 4-year Scholarships and with project opportunities to learn from and perform alongside professionals. The impact of the London Music Fund is inspiring; the Scholarship programme provides sustained and progressive tuition over four years, specifically to children from low-income families.